I want you to make the right choice for you. Many treatments exist to help people stop smoking, but their success rates wildly vary…. *NRT is currently the NHS recommended treatment for smoking cessation, but a success rate of just 10% is appalling. Put another way, that’s a 90% failure rate! 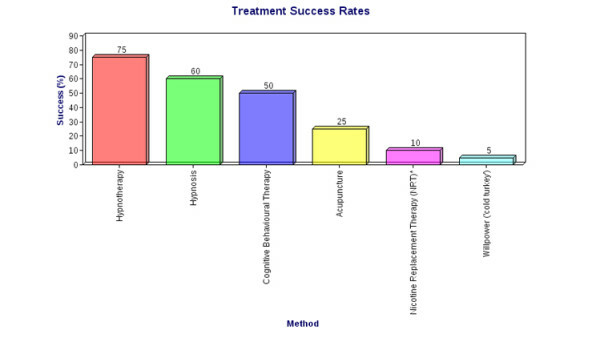 Success rates start to get better with CBT but even that still means 50% of people continue smoking. Hypnosis alone (generally using scripts & hypnotic suggestions) is good, but hypnotherapy alone boats the highest success rate.